How Neds Delegated Power Is Used Part 3 - Steemit Business IntelligencesteemCreated with Sketch. 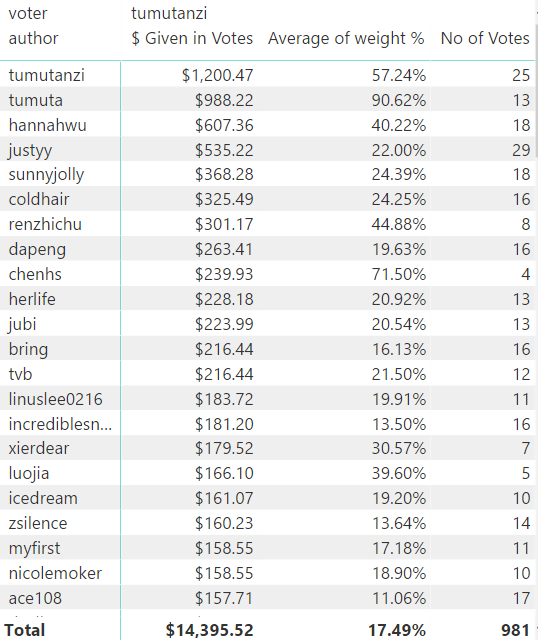 Today we are going to look at the the voting habbits, 15 days before and the 15 days after @Ned delegated Steemit Power to @sweetsssj and @tumutanzi. and it was awesome to see how much in rewards have been spread around the community, lets see if the final two are spreading as much joy! 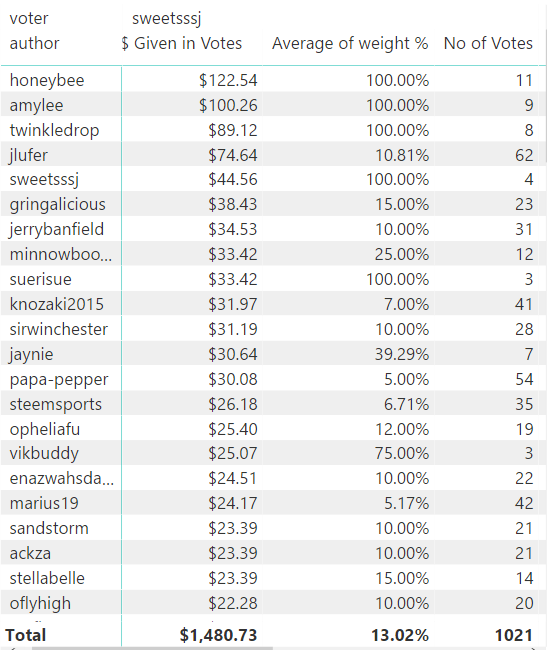 I am familiar with @sweetsssj, and although this post is about the data and the voting habits, @sweetsssj often has posts on the trending page. These posts show @sweetsssj promoting Steemit on her travels. There is always so much going on behind the scenes on Steemit, I wonder is it down to the constant promotion of Steemit that @ned chose this steemain. The effect of this delegation by ned is awesome. 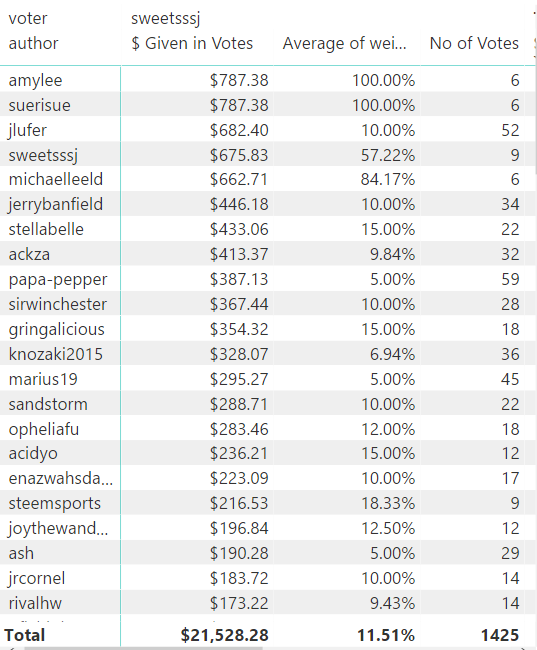 An amazing amount of almost $40K has been distributed in votes by these two lucky people. 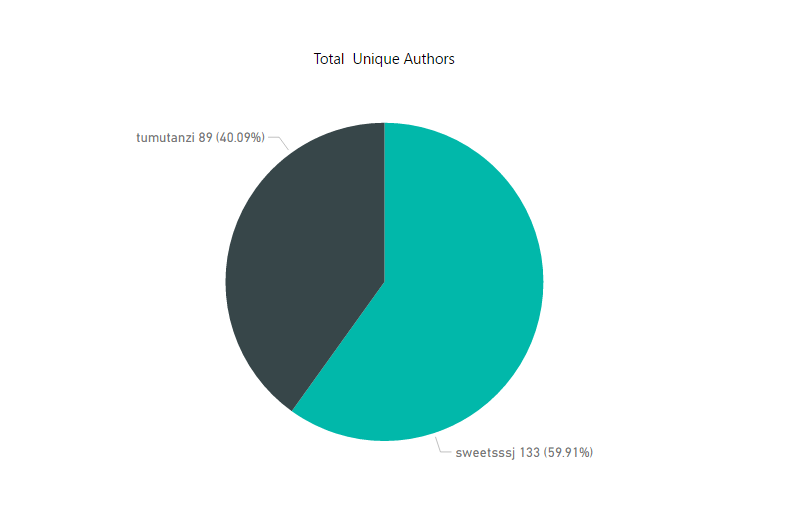 There has been a combined increase of 117% in the number of Authors reached. 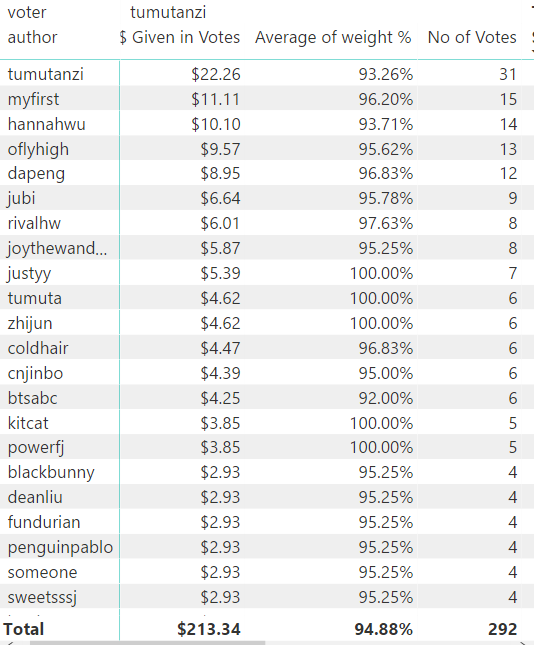 A look at @tumutanzi with 235% increase in the average number of votes per day. 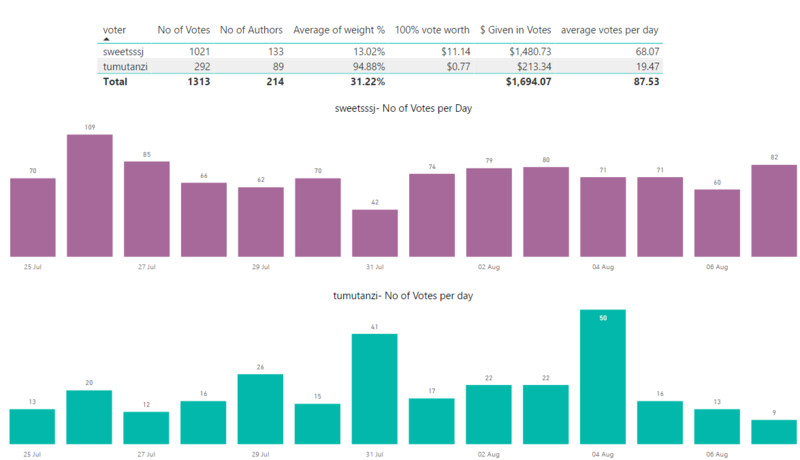 Below are a number of charts showing pre and post delegation analysis of votes by daily Value, Unique Authors, Voting Network, Author by total $ paid via votes. To finalise on this series I will do one last analysis grouping all of the of the lucky steemians that were delegated steem from @ned together so stay tuned. I am part of a Steemit Business Intelligence community. We all post under the tag #BIsteemit. Thank you for this insight analysis, which will help me how to better upvote steemians in the future. I did not know too much about how to use the power wisely at the beginning of this delegation (I even felt very surprise when I knew the delegation). Just after two weeks of experience, I started to learn more about it. I love steemit, which is why I am trying my best to market steemit.com, and indeed an increasingly number of new users are coming, and CN users are creating more and more quality posts every day since the great delegation. I also hope steemians will be enjoying the fun from steemit.com, not just the financial incentive. BTW, a couple of days of the first week of the delegation, I was on travelling, nearly 30 hours on plane from Australia to England, so I really did not have time and internet access to upvote... @tumuta is not an account for @tumutanzi, it is for two other authors for the moment. hay @tumutanzi thank you for taking the time to read the post and leave a comment. its an awesome privilege to be given so much power and if you ask me you are doing an awesome job sharing the love. keep up the good work! There is a lot of content out that is of a good quality. The hard thing to do is getting that content visible to people. The video with no words, blah, the random quote with no words, Blah. The copy paste to a news story, blah, the picture with no words, blah. How do we get good content viewed by people. I try to, when able, to mention at least two people that I think have wonderful content when I leave a comment on blogs that seem to call or ask or do not seem like they would mind me mentioning other content providers, I know some content providers do not like that, so I always give an out that I will edit out the mentions if they want, no harm done, it is their blog after all. Do you or the other big payers have a place where mentions can be dropped off? Please do not upvote this comment. Just looking to help new people with great content out. if that if @paulag's opinions on the matter, then that's what I believe in too! Keep up the good work. It's also very cool to hear your side of the story, so to speak. We are all learning together, here! That is some real good analysis and presentation you did there. I have a bias for @tumutanzi's use of the power. Admirable. 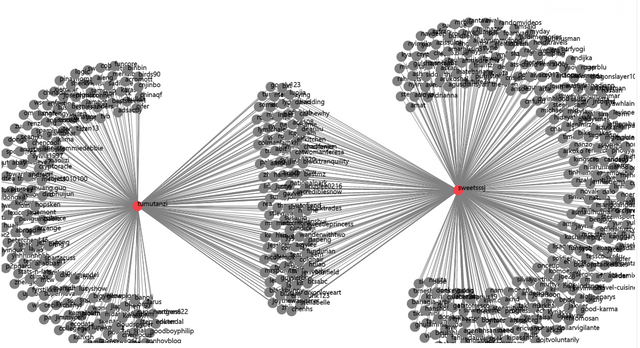 One thing I'll love to change though: the overlap on the network chart after delegation. That could be a factor of similar interests by the two voters analysed, or could just be sheer inclination to vote for already trending posts under different tags. How about the "new" filter? That's where you'll find the most minnows, methink. I understand too there's a lot of crap to sieve through. It's a dilemma I'll love to have. Lol. These people upvote their own posts though with the delegation...At least they were at first... How is this good for the community. Weren't they given that delegation to spread? I think reading Self Upvoting by the Top 100 Authors on Steem? gives us more information about self-voting. Self-voting is not evil at all if we keep a good balance. Sure, and there is so much behaviour going around which is very selfish. No need for me to bother having opinions about the way you vote. Anyways, if there is a problem with self voting, it is not the self voters at faut, but the system. Something like this should help. I believe, if given delegation, I would reward myself as well. The interesting and good thing to me is that they also spread around rewards, and were not completely selfish as some so called "whales". Excellent analysis. Are the data used for this post taken from SteemSQL? This post has been resteemed by @msp-shanehug courtesy of @sammosk from the Minnow Support Project ( @minnowsupport ). Join us in Discord. Great analysis and info. Thanks for that @paulag. Always interesting data :-) So in the long run, it seems like the delegation is having a net positive impact on the Steemit community. 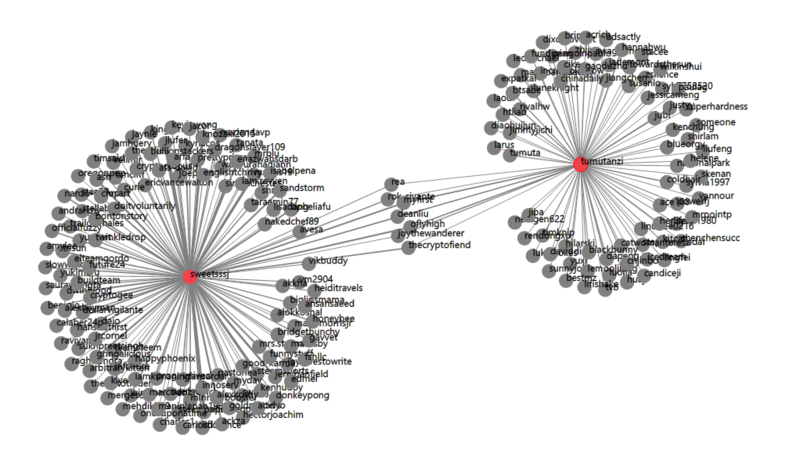 Looks like a broader reach to more content authors with the delegations given out. Many same accounts in the top upvote lists pre/post, but that would be expected as only the value of the vote changes. The overall number of votes cast to unique authors did increase by around 3x too, so that is good. In your last post @surpassinggoogle gave some feedback on it as well, even noting that some of this may be an outreach project to expand reach into Asian countries. He noted other platforms being highly censored and Steemit is a back door around that. 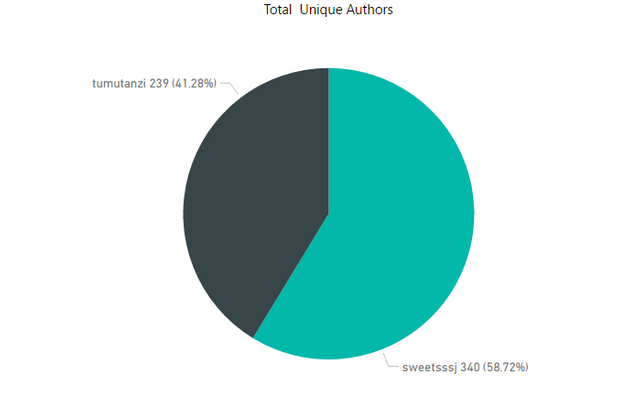 For me, as someone still getting to grips with how all the voting works, the Delegation Network Chart had the most instant visual impact, after that the Delegation Daily Votes Value, there was a tendency to want to compare sweetsssj against tumutanzi with how the graph looked, which is obviously not the idea! I feel that the charts would have been easier to read if they were presents as pre and post for each voter to cut out the scrolling and trying to compare across 2 charts. Great information though and lovely to see how many more authors benefited from this delegation by ned. I really don't understand these posts very well. They are fairly hard to read. I'm not sure exactly what's being analyzed. The delegation between whales is not such an interesting topic for the average Steemian, unless the point is that by doing so more is trickling down (in theory, even though a lot of the flow seems to stay near top rep people). I mean, is part of it that Ned was not utilizing a lot of his votes and that is why delegating was important to activate them? Sorry, but i'm really not following the point of these posts. 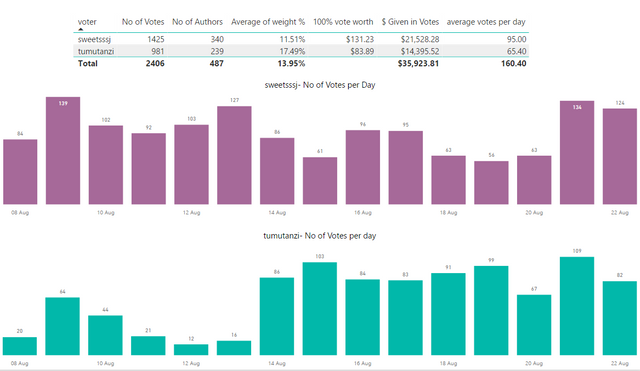 The analysis is showing the difference in voting of before and after these people were give extra steem to vote with, so showing the benefits in that more people received more votes and Steem due to this. I assume Ned is very busy with other things and wanted his Steem Power to be used to help those writing quality posts. Yes, I think that is what we are supposed to assume. @ned is one of the founders of Steemit. he has delegated ALL of his steem to 6 people. Wish I was one of them!!! @paulag don't you think the charts would be easier to read if the before and after was on the same chart? This post has been resteemed by @msp-lovebot courtesy of @sammosk from the Minnow Support Project ( @minnowsupport ). Join us in Discord.